Energy Project Verification - Blog ‐ CCL tax – rises coming soon! CCL tax – rises coming soon! Since its introduction in 2001 the climate change levy (CCL) has been applied on every kWh of gas and electricity consumed under a commercial energy supply contract. Given its relatively low value compared to the overall tariff for gas and electricity it may well have slipped under the radar for many organisations. However, its about to become more prominent. 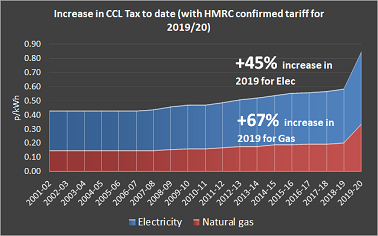 From April 2019 the CCL tax will rise significantly, with a sudden 45% increase in the rate levied for electricity and a 67% hike in the rate on gas. This is well above the rate of inflation rises seen in previous years and will start to make much more of an impact to commercial users. Why is this tax suddenly rising? The reason lies in the government’s desire to simplify the carbon tax regime for industry that previously revolved around the carbon reduction commitment (CRC). This was considered a complex and burdensome tax to administer and operate. Unless you were on a half hour electricity tariff and consumed around 6GWh a year you may well have been oblivious to the CRC scheme as your site would not have qualified for participating in this tax that levied between £16 and £17 for every tonne of CO2 emitted. From April 2019 the CRC scheme will disappear and the government has determined that CCL will pick up the slack. Hence the sudden rise in CCL next year. If you were previously participating in the CRC scheme you may see a lower overall cost from the omission of CRC and increase in CCL. However, if you were never in the CRC scheme in the first place then you may be surprised to see a sudden hike in this tax and may not have planned for this additional expense. What can you do to hedge against these increases? Well if you are an ‘energy intensive’ user typically operating in the cement or intensive livestock industries you may already be exempt in part (up to 90% of electricity CCL) under a Climate Change Agreement with agreed targets for improving your energy efficiency or your carbon emissions. Some consumers are already on ‘green’ energy tariffs through their energy supplier. These tariffs are based on sourcing supply from renewable and low carbon generation making them ‘exempt’ from the CCL tax. On the face of it they look like a good bet. Be careful though, as if you do the sums in detail you may find that the tariffs work out to be about the same as having a normal tariff and paying the CCL. These tariffs are usually available for electricity only, so you are still left with paying CCL on your gas use. Of course, avoidance of importing the energy in the first place is the best position to be in to try and hedge against carbon taxes and any other energy price rises for that matter. So, having an energy reduction strategy in place that has identified opportunities to save consumption from conservation measures and generate renewable energy with known financial returns on these investments is a good place to be. You don’t necessarily have to spend a lot of money on fancy wiz bang green technology to save money. A strategic look at your consumption patterns and making some changes on managing when your demand occurs could cost you nothing but save you money straight away. For some sites, the potential to hedge against both gas and electricity price rises at significant levels may be possible through utilisation of combined heat and power (CHP) generation. CHP utilises gas to generate electricity and the heat by-product is used to satisfy base heating demand. Boilers are normally still required to top-up and meet any remaining heat needs. It may be possible to avoid CCL entirely on gas used at your site if your boilers are included in the CHP boundary and the CHP itself meets the efficiency standards required by the CHPQA. This means CCL could be avoided on all gas fuel used by CHP plant and boilers and avoided on electricity generated that would otherwise have been imported. We have real examples where energy schemes have avoided CCL on boiler room gas and electricity from generation or reduction in demand through energy efficiency projects. Savings are proven and audited through M&V to IPMVP standards to maintain optimisation over operational life. Sign up to receive our newsletter for the latest news and updates.